Ready for more advanced training? Join us June 3-5 in Seattle! A Networking Pass provides outstanding value that will help you become a better marketer at an affordable price. 9+Solutions Track Sessions from market-defining vendors. Networking Events: Attend any or all of the networking events to make invaluable industry connections. 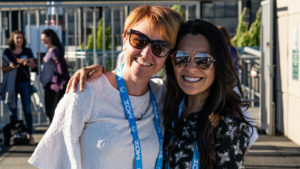 SMX Mobile App: Customize your agenda, connect with vendors, and maximize your conference experience. Private Facebook Group: Join the official SMX event group to easily interact with others before, during and after the show. We’ll approve your request as quickly as possible. It’s a great opportunity to participate in discussions, questions and show announcements prior to arriving on site. Exceptional amenities: Breakfast, lunch, and complimentary Internet access are all part of your Networking Pass registration. Please be sure to read the SMX Code of Conduct, which is observed at all conference functions with no exceptions. The resources below will help you connect with others who have similar interests or work areas before you come to the show so that you can have a successful conference network experience when you arrive. Check out these tools and ways you can share blog posts, photos, and videos. Follow our Facebook SMX Fan Page to network with others, take part in conversations, and keep up with SMX news and announcements throughout the year. Twitter: SMX — Tell the world you’re coming to SMX by using the #smx hashtag on Twitter! You can also keep up before, during and after the conference by following our Twitter feed. LinkedIn: SMX — Member of LinkedIn? Join the SMX group and connect with others who are interested in our conferences. Instagram: SMX — Love taking photos? We’d love to see yours from the show. Follow Search Marketing Expo and share your photos by tagging them with #smx. Youtube: SMX — Make sure to check out the SMX YouTube channel for video clips from SMX! See you at SMX West in San Jose! Get updates, exclusive offers, and breaking news!